Born from our passion for cooking and concern for the planet, the Ecolution line of cookware offers a full range of kitchen tools. 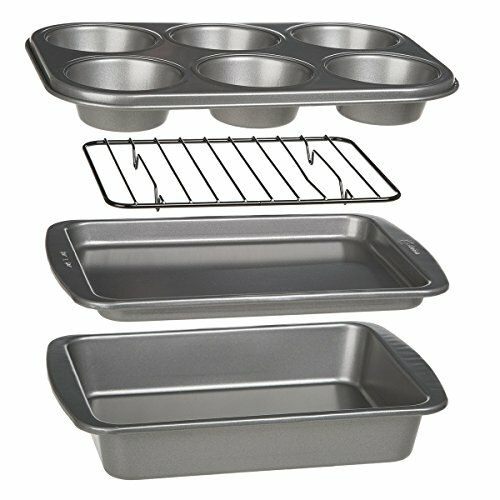 All Ecolution products are quality made, and our 4-Piece toaster oven bakeware set is no different. Designed using durable heavy duty carbon steel that allows for even baking and browning, the Ecolution bakeins 4-Piece toaster oven bakeware set is the perfect pairing of kitchen tools for any and all types of chef! this set is covered under a limited lifetime warranty and includes a cake pan, cookie sheet, 6 cup muffin pan, and a cooling rack, all with safe non-stick coating that allows for easy food release. Ideal for toaster ovens and smaller ovens, this 4-Piece set allows you to create yummy baked desserts, casseroles, and many other personal sized meals. This set is PFOA, BPA, and PTFE free and comes in packaging consisting of 70% recycled material, reflecting our commitment to safe cookware for both you and the environment. Cook well. Do good.